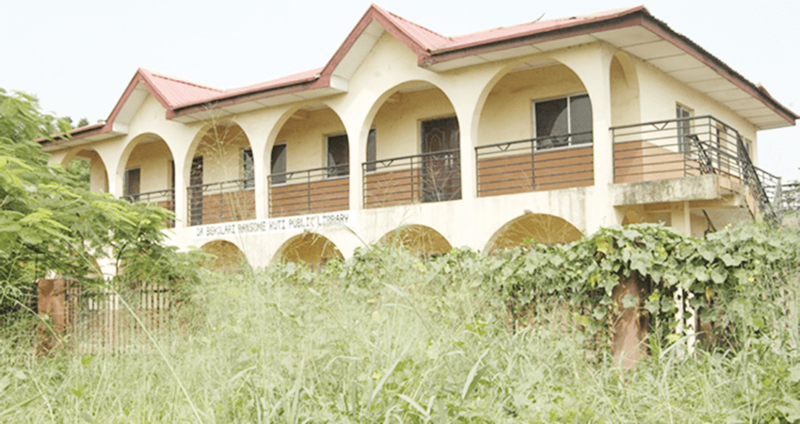 Abandoned Oshodi-Isolo library to become NYSC lodge - Corpr! On the 17th June, 2011 the administration of former council boss, Hon Afeez Ipesa-Balogun commissioned a public library named after the late Dr. Bekolari Ransome Kuti (Beko), lat human rights activist and immediate younger brother of Fela. That was a move to immortalize him for his work as a human rights activist. Unfortunately, the library today sits idle behind the Lagos State Corporation office in Oshodi without enabling furniture that define what a library actually looks like and books that can be read. Despite the fact that Oshodi-Isolo Local Government Area has had a chairman after the administration of Ipesa elapsed, the building has remained untouched since its commissioning in 2011. The site of the library called Dr. Bekolari Ransom- Kuti public library clearly shows that the library building has been abandoned by the government. According to Afeez Ipesa, the library was built through the intervention of state fund and the fund was not enough to actually equip the library with the enabling furniture and books that prospective library users can make use of. He further stressed that the library would have been furnished and properly equipped but the approved fund was meant for the construction of the building alone, so that the government that comes into office after he left will consolidate on the project that were not completed. He described the construction of the public library as an effort to positively contribute to level of education in the local government and to also increase the reading culture of students within the council area. Meanwhile, Hon. Alausa Adekoya, the education secretary of Oshodi-Isolo Local Government Education Authority, who is saddled with the responsibility of managing public, primary and junior secondary schools of the local government, explained that government is supposed to be continuous such that an administration will continue from where the previous administration stopped. He explained that the immediate past Chairman of the Oshodi-Isolo Local Council Area, Hon. Muse Bolaji Ariyo was expected to go ahead with the furnishing of the library with required books and furniture, so that it can be opened for public use but nothing was done for the past three years. He further noted that the library would be used to accommodate youth corps members, who are posted to the local council area if the government refuses to take actions towards furnishing the library or allowing the state library board to take over the library. Mr. Alausa said, “And now, we are looking at another administration to take the project up. At this point, I am looking at an avenue that if nothing is done to it, we will ask the state library board to take it up. There has been letters as regards this library. It was even budgeted for but the execution is nothing. Community NGOs have written to him; he did nothing after three years. Also, Engr. Afolabi, who was one of the engineers who built the library by the engineering department of the Oshodi- Isolo Local Government, explained that the building was not equipped with the necessary furniture and books because the fund allocated to the library project was only meant for the construction of the building. However, the immediate past chairman of the Oshodi-Isolo local council area, Hon Bolaji Muse Ariyo has explained his administration’s failure to consolidate on the efforts of Hon. Ipesa as regards the Dr. Bekolari Ransom-Kuti public library, hinging it on the paucity of funds at the local level. Muse said that there were too many projects in the hands of the local government but funds were not sufficient to effectively carry out those projects. He said: “When we came in into office, there were many things we set out to do. So, in order to serve the people well, we had to set our priorities right, of which we discovered and embarked on building health centres, renovation of schools without good buildings, furniture, and also giving new school uniforms and books to many pupils in our public schools.